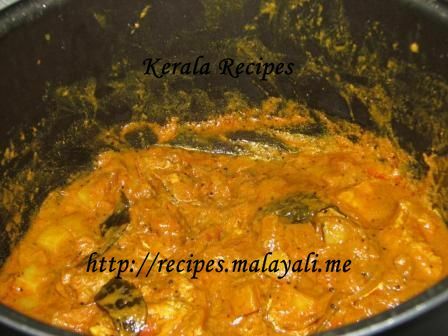 This spice-rich chicken curry preparation of Kerala has regional variations in terms of ingredients used, but nevertheless has the same combination of spices that adds to its flavour. 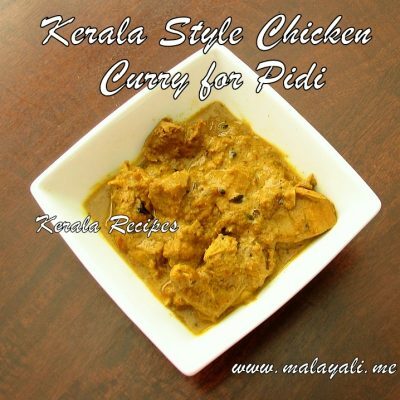 Here is the recipe for a very basic Kerala Chicken curry which uses Coconut Milk. 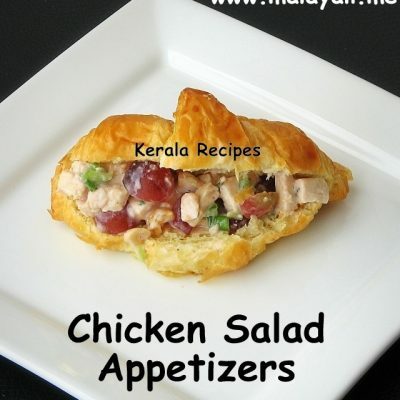 I have used Potatoes in this recipe and I know many Keralites love the combination of Chicken and Potatoes. Clean and cut the chicken into medium sized pieces and marinate it with the above ingredients. Refrigerate it for an hour. Heat a kadai or non stick pan and add coconut oil. Splutter mustard seeds and sauté the sliced onions and curry leaves till the onions become translucent. Next reduce heat, add chilli powder, coriander powder, chicken masala powder, ginger paste, garlic paste and saute for 2 minutes. Add the chopped tomato pieces along with little salt and saute well till the tomatoes are pulpy and mashed. Add the potato and chicken pieces to the kadai and add 1 cup of water. Throw in the cilantro leaves. Reduce heat and simmer, covering the pan until the chicken is tender and cooked. 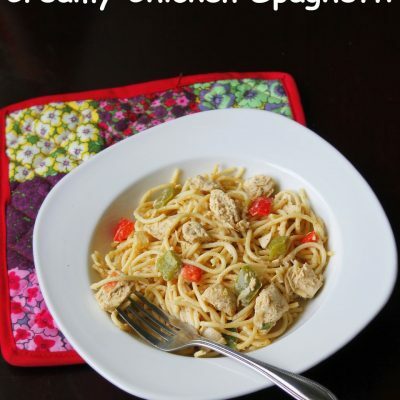 This may take around 25-30 minutes depending on the chicken pieces used. Stir the chicken curry occasionally while it gets cooked. Finally reduce heat, add coconut milk and stir gently. Simmer for another 2-3 minutes and remove the curry from stove top. Chicken Masala is a grated mixture of Coriander, Turmeric, Chilly, Black Pepper, Fenugreek, Cumin, Cloves, Cardamom, Cinnamon, NutMeg, Mace and so. You can use any store bought chicken Masala Powder or you can prepare it at home. Brands like Eastern, Saras, Melam, Priyom, Niraprara etc. are good. 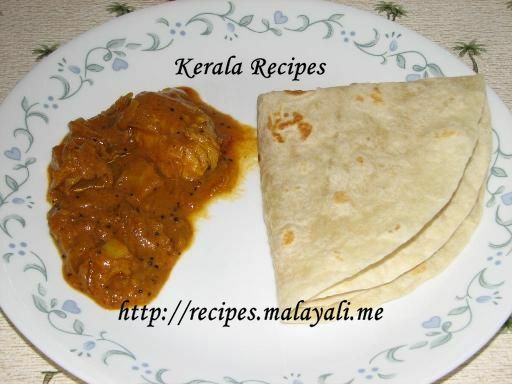 Click here for Home Made Chicken Masala Powder ingredients. For more gravy, you may have to add more water while the chicken gets cooked. Chicken Masala is a grated mixture of Coriander, Turmeric, Chilly, Black Pepper, Fenugreek, Cumin, Cloves, Cardamom, Cinnamon and Nut Mace. I have updated the Note section of the above recipe. 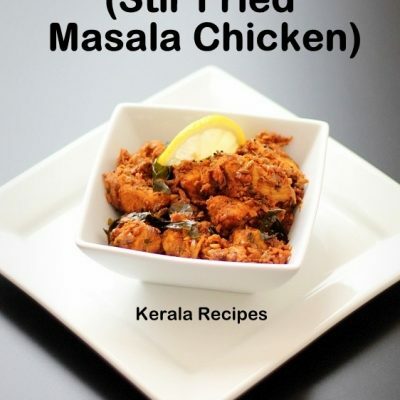 Please click on the link to find the ingredients for Home Made chicken masala powder or visit http://malayali.me/?p=1452 . I just have a quick question here. What are the ingredients for chicken masala and fish masala that you use in your recipes. Is it something that you make at home or is it store bought. If it is the latter can you let me know the brand name of the product. I use store bought Chicken/Meat & Fish Masala powders for convenience. I generally use Eastern brand of masala powders and it is good. I have also tried other brands like Melam, Priyom, Saras, Nirapara etc. Please recommend a good readymade coconut milk brand, have you used nestle coconut milk powder in your cooking? I use Canned Coconut Milk. A few good brands I have used are Savoy, Chaokoh etc. I haven’t tried Nestle Coconut Milk Powder. I had tried all of your recipes that you have added here and i find it really useful for me as i am new to cooking. Why don’t u add some mutton recipes too? Thanks for really helping me with all of your recipes. Thank you so much for the recipe. I tried it and it came out really good. my kids also liked it as it was soft and creamy. The gravy was perfect for Kerala Appam. 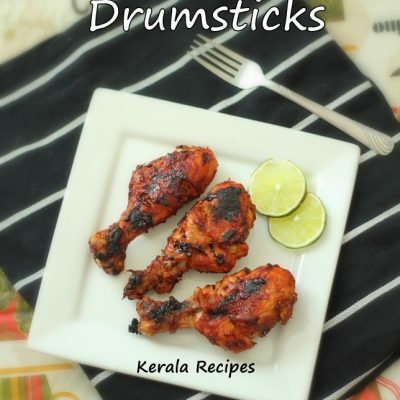 Once again thank you so much for posting these traditional Kerala Recipes. I make this all the time for my Indian husband. Well, I started off making it for him, now it’s for both of us! Thank you so much for it: we all love it! I just made this, turned out very well. Served with pulao.